Next Generation of Young Role Models! Olga Barth, also known as OE, is a young lady full of life who lights up a room with her smile! OE is 11 years old and is a 4th grader at North Fairview Elementary in Topeka. OE has had Cerebral Palsy since birth and communicates through an AAC device. 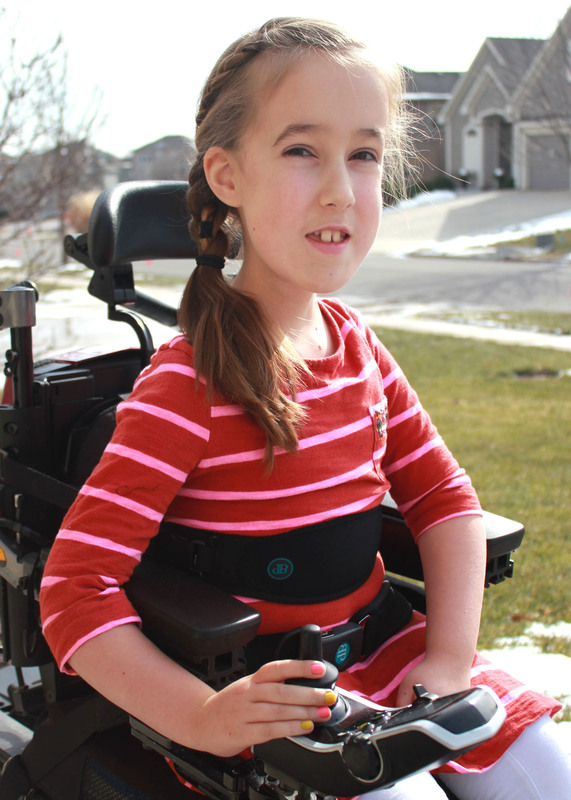 She does not let her disability stop her from being an energetic, happy, active 11 year old! OE enjoys being included in everything. She loves interacting with her peers at school, is very social, and loves and accepts all people. OE especially loves spending time with her family who adopted her about six years ago. She is tri-lingual in English, Russian, and American Sign Language. OE is involved with a Boccia League, loves swimming at the Easter Seals Capper Foundation, and enjoys playing hockey in PE at school. She has been described as amazing, happy, loving, social, and ornery. OE loves to have fun and make people laugh! When OE grows up, she would like to be a vet and take care of animals. Follow OE's year on the Little Miss Wheelchair Kansas Facebook page! Visit the Latest Event page for more information about the 2019 Ms. Wheelchair Kansas event. 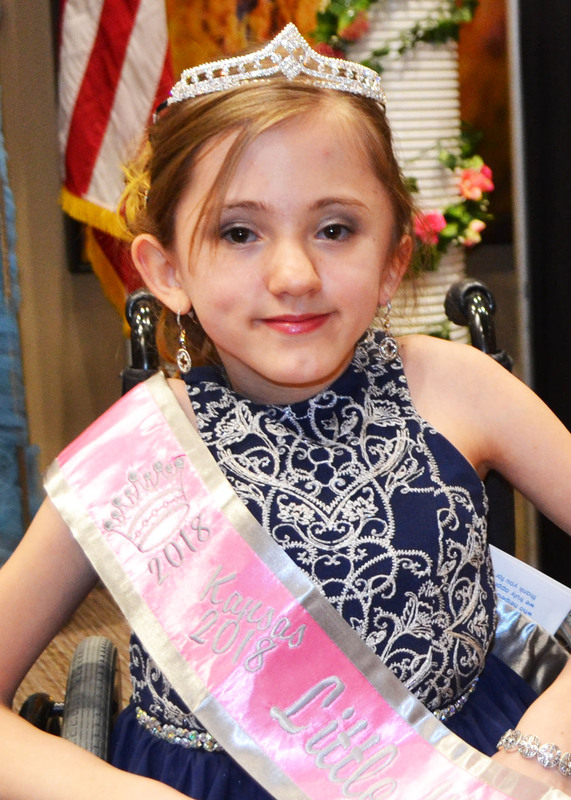 To arrange a speaking engagement or public appearance by Little Miss Wheelchair Kansas 2019, please contact Carrie Greenwood, Little Miss Co-Coordinator, at 785-267-5982 or mswheelchairkansas@yahoo.com. WARNING! A new window will appear. You must have Adobe Acrobat to view these articles. For a free version, click the link below. Ariana Hutchinson is an energetic and involved 12-year-old who does not let anything keep her from having the fun she loves! Ariana was born with osteogenesis imperfecta, which causes her bones to break easily. Her wheelchair helps her get around in her community safely. Ariana attends 7th grade at Robinson Middle School in Topeka, Kansas. She loves having sleepovers with her friends, listening to music, making videos, and going to after school clubs and dances. Ariana also likes making and creating things, and she especially enjoys photography. This year, she will also be participating in her school’s play. Ariana enjoys spending time with her family, and is looking forward to meeting people and forming new friendships with other girls and women with disabilities. When she grows up, Ariana plans to attend college and become a professional photographer. 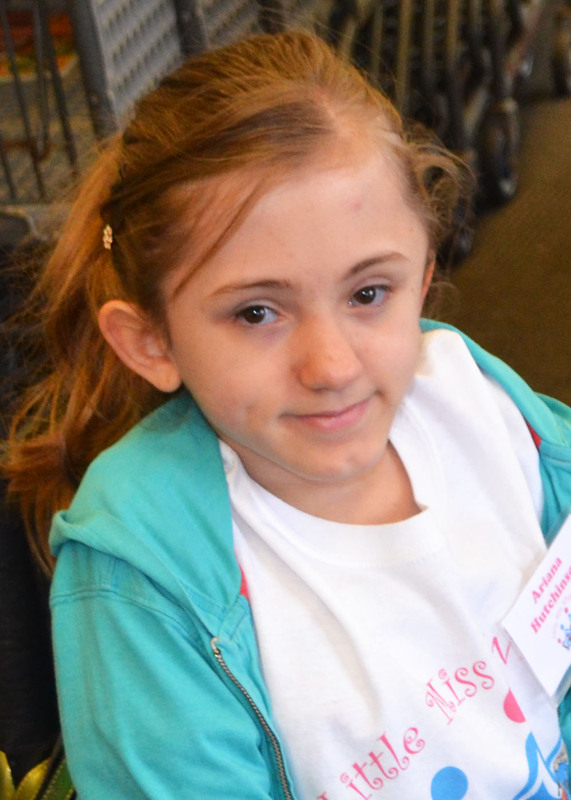 Follow Ariana's year on the Little Miss Wheelchair Kansas Facebook page! Visit the Latest Event page for more information about the 2018 Ms. Wheelchair Kansas event. "Ms. 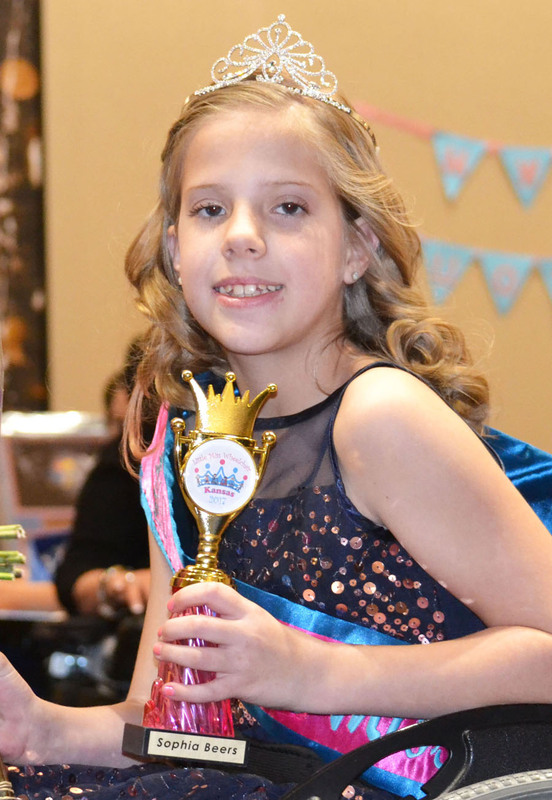 Wheelchair Kansas crowned 2018 in Lawrence"
Sophia Beers is an outgoing, happy, 10 year old who does not let anything hold her back! 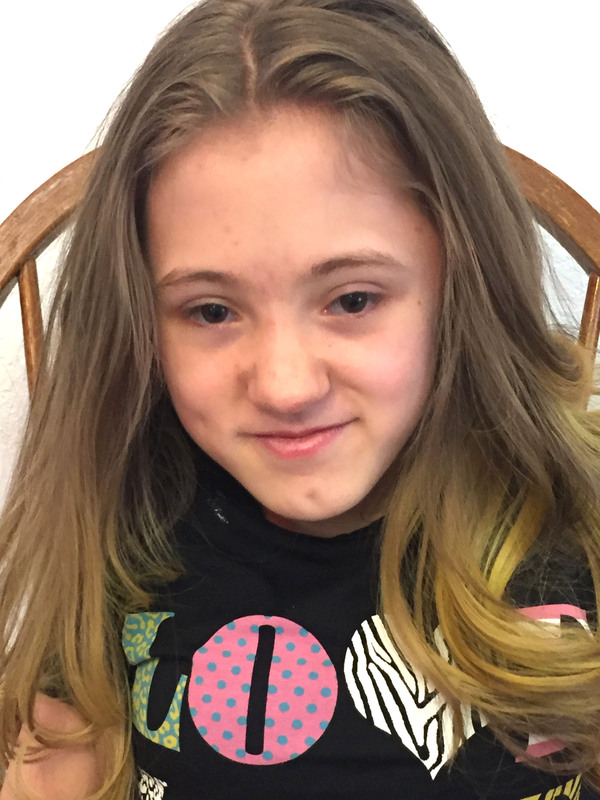 Sophia lives in Wichita with her family and currently attends Explorer Elementary School, where she is a 4th grader. She loves to get out in the community and participates in 5K races with her family. Sophia also enjoys swimming at her local YMCA. Sophia has had spina bifida since birth, but does not let that stop her from being full of life and active. If Sophia wants to participate in something or achieve a goal, she will find a way to do it! She has been described as strong-willed and beautiful inside and out. Sophia loves animals, especially dogs and zebras, and wants to be a veterinarian or own a bakery someday. She also loves chocolate and baking with her family. She loves the color pink, going to the movies, and painting. Sophia is a caring, soft-spoken young lady who is ready to take on the world… or at least the state! She will do just that as she takes on the title of Little Miss Wheelchair Kansas 2017! Follow Sophia's year on the Little Miss Wheelchair Kansas Facebook page! Visit the Latest Event page for more information about the 2017 Ms. Wheelchair Kansas event. "Ms. Wheelchair Kansas pageant empowers local women with disabilities"
"Miss. 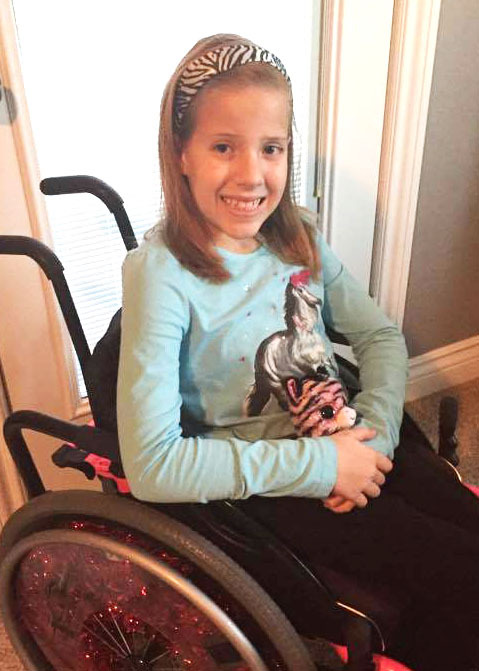 Wheelchair Kansas crowned in Lawrence"
Aubrey May is a smart, outgoing, 9-year-old who loves to meet new people! 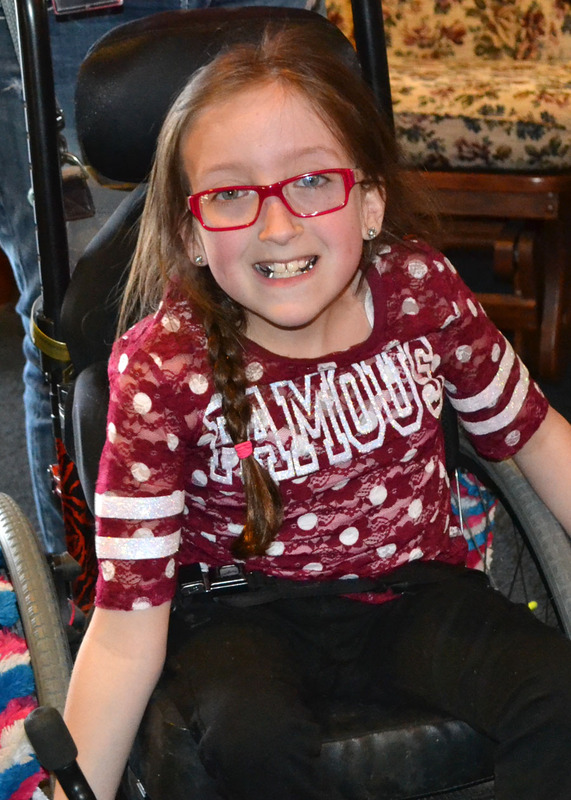 Although she faces many challenges due to having congenital muscular dystrophy, she almost always has a positive outlook and spreads happiness to others. Aubrey lives in Olathe and is currently a 4th grader at Cedar Creek Elementary. She loves playing with her two sisters, hanging out with friends, and being involved in school and church activities. Aubrey is involved in the “Chirpers” children’s choir at church, as well as her school choir. She is in the Battle of the Books Club at school and is involved with Miracle League Baseball. 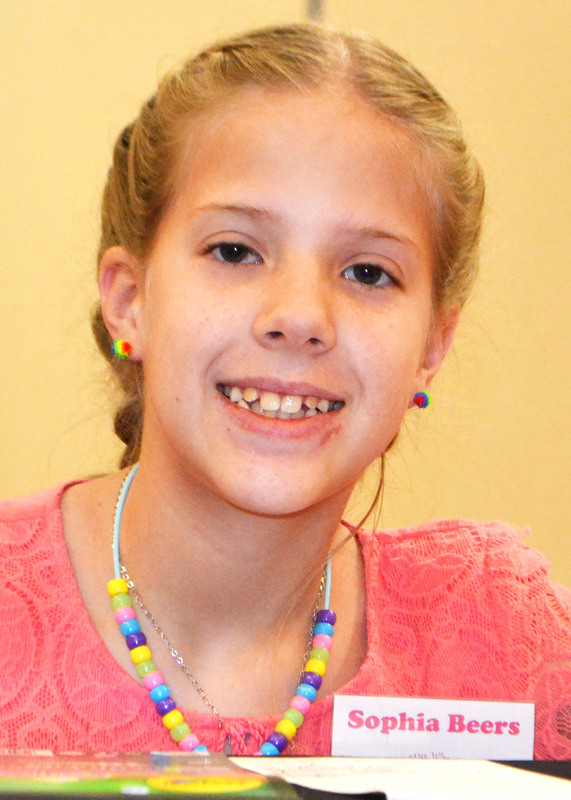 Aubrey has been described as friendly, brave, smart, outgoing, and kind! Follow Aubrey's year on the Little Miss Wheelchair Kansas Facebook page! Visit the Latest Event page for more information about the 2016 Ms. Wheelchair Kansas event. "2016 Ms. Wheelchair and Little Miss Wheelchair crowned"
"Ms. 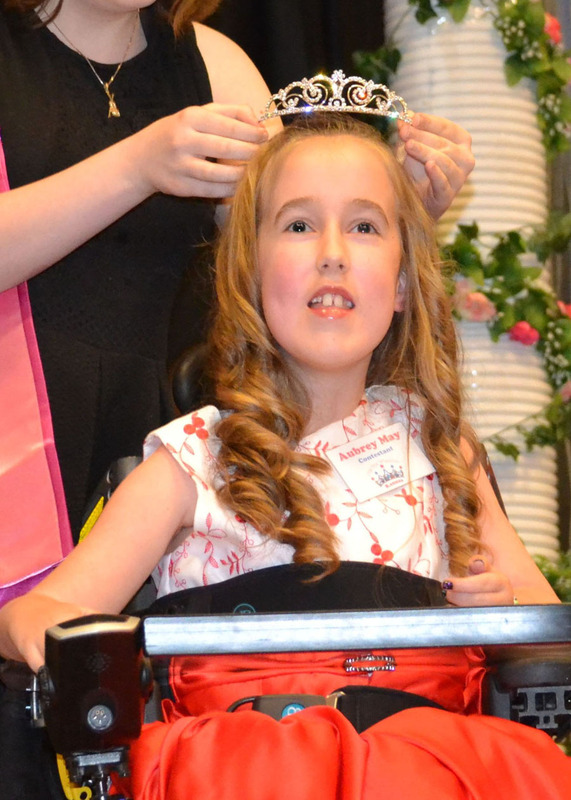 Wheelchair Kansas and Little Miss Wheelchair Kansas crowned in Sunday ceremony"
Delaney Murphy is a sweet, funny, sassy, caring little girl that instantly grabs your attention when you meet her! This enthusiastic 10 year old was born with Spina Bifida. She goes to school at Garfield Elementary in Ottawa and is in the fourth grade. Delaney is a member of Sacred Heart Church. She has been involved in a Make A Wish Walk and is a supporter of the Rodney White Children's Foundation. Even at a young age, Delaney has been making a difference! She helped with building the first accessible playground in Ottawa. Delaney is no stranger to the Ms. Wheelchair Kansas family! She has been a bright light at the past four crowning ceremonies while serving as a flower attendant. When Delaney loves something, it shows inside and out! This includes her love of baseball. Delaney is a huge fan of the Kansas City Royals with Alex Gordon being her favorite player. She loves cheering on her brother, Jackson, when he is playing baseball and serves as his biggest cheerleader. This spring, Delaney herself will be involved with the Miracle League Fields. Like most girls her age, Delaney loves spending time her family and friends. Delaney also loves music! Her favorites include One Direction, Taylor Swift, and Luke Bryan. This energetic young lady can light up a room and will surely be a bright spot in our state as she fulfills her duties as the FIRST Little Miss Wheelchair Kansas! Visit the Latest Event page for more information about the 2015 Ms. Wheelchair Kansas event. "Little Miss Wheelchair's reaction to success: I was literally screaming"
"Washburn Alum Wins 2015 Miss Wheelchair Kansas Crown"
"2015 Miss Wheelchair Kansas Crowned"
To annually select one young girl, who is wheelchair mobile, that will serve as a role model to her peers, share her story, educate other young people, and be mentored by our adult titleholder. What is Little Miss Wheelchair Kansas? 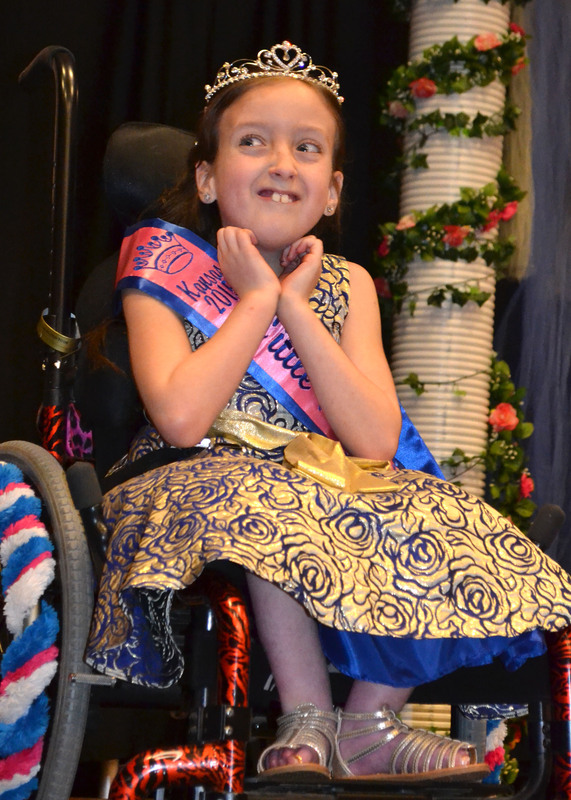 The Little Miss Wheelchair Kansas program recognizes young girls, ages 5-12, who are wheelchair mobile, dynamic, spirited, positive, and who have something to say to the people in our state! Each year, one girl is chosen from a pool of contestants to serve as the Little Miss titleholder. Whoever is chosen works alongside our Ms. 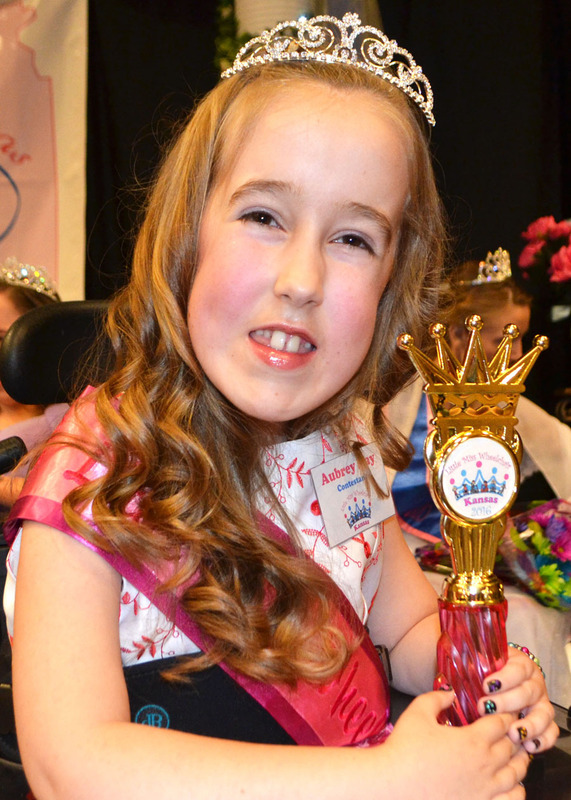 Wheelchair Kansas titleholder to empower and educate people of all ages. She attends various events, shares her story, serves as an example for other youth with disabilities, and empowers Kansans through her positive attitude. Travel within her city and other cities in an effort to empower young people with disabilities and educate her peers without disabilities. Make a minimum of 10 appearances per year. Be mentored by Ms. Wheelchair Kansas. Fundraise in order to pay for mileage and other needed expenses. Promote Little Miss and Ms. Wheelchair Kansas in a positive light. Attend the next year’s crowning ceremony. Have fun, experience new things, and share a positive attitude! Contestants are nominated and their parent/guardian must agree to the nomination. Nominator fills out the nomination form. Form is submitted with a short video made by contestant and a portrait of the contestant (to be used in the program). Applications reviewed by a selection committee and winner is announced at annual crowning. All contestants are invited to part of the Ms. Wheelchair Kansas weekend. 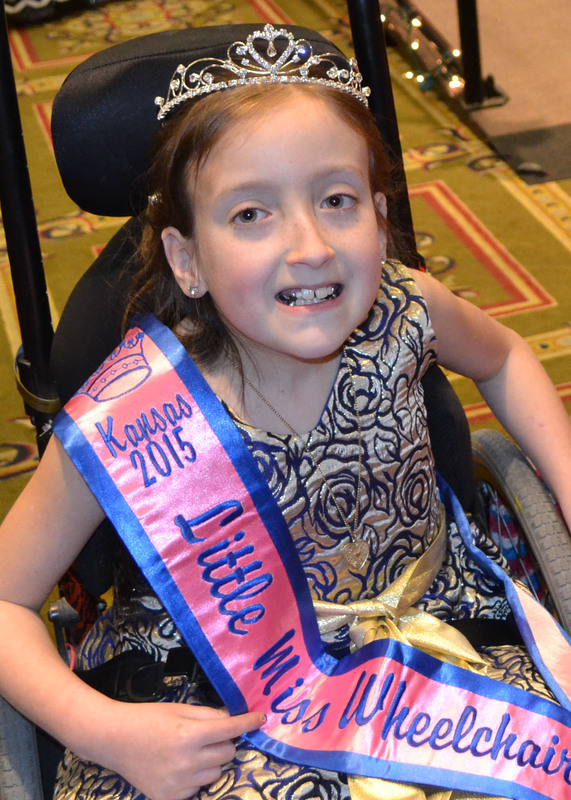 Little Miss Wheelchair Kansas Nomination Form Nominations due by JANUARY 7, 2020!